Too, too hot. Last Sunday my daughter didn’t even want to go to the pool. Everyone was stir crazy and grouchy. We settled on a (very rare) trip to a nail salon. I got dark, pearly red-to-burgundy toenails. My daughter has an amazing eye as an artist and wearer of her own style. 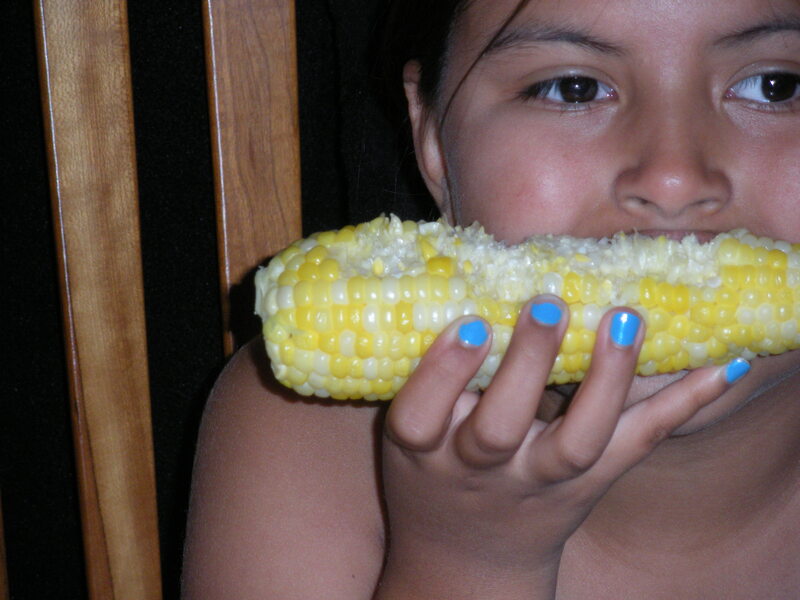 July 18, 2010-- corn on the cob for dinner. I remember when my daughter was very, very new–a newborn and new to us, when I was newly in love with her– awakening each night to feed and hold her, but also to marvel in the quiet of each night, just she and I, enjoying my incredible good fortune, that I was finally a mother. To my particular baby girl. In one of those early weeks, which was a hot summer as it is now, I had a medical problem that required a visit to a new doctor. Who kept me waiting for at least 45 minutes. Maybe an hour. Although I was very rarely separated from my daughter in those days, except to be at work, I left her at home with my partner at the time. I remember that wait in the waiting room well. What would have normally exasperated and stressed me– seemed like a funny luxury. I thought, this is interesting. As the mother of a 6 week old (or something like that) it’s not so bad to have to just sit still, with nothing in particular to do. I think I just sat there for awhile. I read a People Magazine and I called the phone company about something. (I really do remember all this, though I have no idea the name or address of the doctor I saw that day…) It was a very restful and satisfying wait as I recall. This is the summer of waiting–but I do not feel so relaxed about it, though I am recollecting that earlier wait– perhaps to try to recreate that easy feeling I had about the whole thing. I am waiting most of all, to find out if I or others who work closely with me are going to lose our jobs– individually and collectively. I feel at times, as though I have been holding my breath for weeks. It’s a peculiar thing about this classist world, that often as middle class people we feel “protected” in some way from the actual goings on of the world. But, I think, in more ways than we often know, we are not necessarily protected– and we are all in this boat together, sink or swim. In it together in so many ways. In an odd way, as I hear the stories in the news, on NPR and elsewhere, about the economy, lay-offs, people out of work– I am both fearful and enjoying this clarity about my togetherness, unity with the rest of everyone. It’s been extraordinarily hot, and will reach, they say, triple digits, the next few days. I am waiting for it to cool off. The job uncertainty has pushed me in other ways too, and I am trying to figure out some other things that I cannot report on now, but that have involved a lot of waiting in my life. All of this waiting and the random fears have made it markedly harder to write than I want it to be– so I am waiting too, for that to pass and for the writing to be more regular again–easier and perhaps more interesting. I want to be less preoccupied and more enthusiastic and easy in the moment. My Bat Mitzvah–the meaning (to me) of which I have still not written about here, is looming closer and closer and I am definitely hoping time will slow down on that one, so I can learn all I need to. But I am still working at taking that perspective that I had all those years ago, in that doctor’s waiting room–of enjoying the wait just as much as I enjoyed where I had come from and where I was leaving to go next. It was a good day, despite things not going really just right. I had planned to be home for the day but I needed to be in the office. So I went. I heard from many friends, some of my very best friends, as well as my mother, sister and each of my two nephews– who now contact me on their own on their cell phones. I love them and I love the young people they are and were and the older people they are becoming. My old friend L called from San Francisco. For my daughter the occasion of my birthday seemed to bring up many sadnesses, disappointments and other hard things so it was a bumpy road from that perspective. During the day, in addition to getting his birthday message, I texted back and for with our housemate A– who I hadn’t seen in days and who came home to the wireless router I ordered– while I was still at work, and installed it. Now if that isn’t a gift that goes with the territory of having a 19-year-old housemate I don’t know what is. I got emails from several others– friends I love and miss having much closer. My father, who I miss a lot at different times, loved modern architecture. I learned early on from my dad the phrase, and the author of the phrase, “Less is more.” It was the architect Mies van der Rohe who said it first. Or at least said it famously, first. I grew up with the phrase. Sometimes less is not more– more close people, more rigor in fixing the world, more attention to people you love– in many instances more is more. But in some realms less really is more and I had a wonderful success on that front for my birthday. Instead of the many more complicated things I have often tried to do for my birthday, and which have often left me both tired and too stressed out to enjoy myself– instead of that, I cooked/ prepared dinner for my home girls– me, my daughter and partner and A who is now our guy at home. And I told him to go ahead and invite a friend of his. So one of his young women friends came too. This is one of the joys of having a new roommate actually. I held the line at “family dinner– that’s all I want!” but it was company too. I cooked. I set the table. I loved preparing the summer food– the very simplest, good food. Corn on the cob, chicken that we had gotten it together to marinate overnight and my very favorite– gazpacho. For years I have loved gazpacho and tried many increasingly elaborate recipes which have involved more and more effort and which I have enjoyed less and less– and not because of the work involved, but because of the end product. So then I stopped making gazpacho and just started eating it– buying it from the farmer’s market, going to two different restaurants where they make a gazpacho I like. I tried and tried to figure out what was the secret to the couple of recipes that I really liked but I could not figure it out. As it happened, we joined a pool this summer– a cooperatively owned pool (that funky, eclectic hippie-ish set up and group at the pool is another story for another time). On the first day we went, we set up with two other families that we know well– and the dad in one of those families, our neighbor, is a restaurant owner. He had brought a huge jug of his own home made gazpacho among the many offerings we had for a Memorial Day weekend picnic. Eureka!! He had something that was right in the family of those recipes I have loved. And he gave me the recipe. The secret? Taking out most of the ingredients I had been putting in, all the things I kept adding to try to get it right. So I tried a slightly altered rendition at home for my birthday dinner. And it was perfect– just the flavor and texture I have been longing for. Less was indeed more. So here is my first blogged recipe. Skip the yellow or purple onions, V-8 juice, garlic, lemon, red or green peppers, and other things. Use: 8-10 fresh tomatoes, 2 cucumbers skinned, 2-3 spring onions, 1/2 cup of olive oil, 1/2 cup of red wine vinegar mixed with some balsamic vinegar. Salt and pepper. Your blender or food processor. You’re done. So when it comes to birthdays and gazpacho, Mies van der Rohe was definitely right– less is more and delicious too. Then accidentally, instead of hitting save, I hit publish. Oops. I realized what I had done later and pulled it back, but it was out there at least for a little bit. It was harmless enough but it is one of those nightmares about email or a blog– instant publication when you didn’t mean to. Notwithstanding having put something out into the somewhat public domain when I didn’t mean to, I am having trouble getting back into a writing groove. And I am having trouble getting back into a reading groove too. I am re-reading things I have loved and relied on, but can’t quite get comfortable in a new book. If you have suggestions– especially suggestions of non-fiction that will engage and uplift– essays, memoir, I would love to know. Eventually I will post the writing I have been working on that explains a bit about that bleakness that I’ve been seeing around me and the part of my Tuesday training that lifted my spirits. For now pre-birthday I treated myself to three very inexpensive striped tee shirts (stripes are a favorite of mine) and flower printed hair clips for my daughter and two other little girls who will come to celebrate my birthday with me over the weekend. We bought corn and tomatoes for corn on the cob and homemade gazpacho for dinner tomorrow night. I watched and listened to Bon Iver, Black Eyed Peas and some old Dana Carvey routines on YouTube tonight. My daughter and I listened to a Dana Carvey routine that a friend of hers showed her and she laughed so hard, it was a delight to watch. If I can get to sleep things will bode well for the birthday. And I am wearing one of the striped shirts right this moment. Maybe I can write about justice or families– families hanging in there, as well as a little about families in crisis, or about poetry tomorrow. Those are some of what are on my mind. Or if not that, I can write about cake. Ice cream and flowers brought home from the store by my good partner. Bright flowers, already wishing me well from the dining room. In many ways what is unfolding is a tough summer. The oil continues to pour into the Gulf of Mexico. At work I spent many hours interviewing a young woman whose life story is the story of terrible abuse; people and systems who have failed her over and over and over. But she has, really against all odds, a beautiful smile, an interesting mind and point of view; a clarity about what she wants and needs, a hope for better. July is just getting underway and it was 103 degrees here yesterday. It’s hot. We went to the Midwest for July 4th weekend, though not really to celebrate the 4th of July, but rather to celebrate what forever is connected to 4th of July for me, the birthday of my wonderful sister who was celebrating her 50th birthday on July 5th. We had a great time that included cake and basketball games and old friends and fireworks. Yes, she is my younger sister and yes, that means I am past 50. It was hot there too– too hot but we had a really good time together. Late in the trip my partner called her mother to say hello, realized her mother was sick and took off for Indiana where she has stayed all week. My mother-in-law is ok– all the tests came back with good, not bad results. I have been a solo mommy unexpectedly this week. Which I thoroughly enjoy. It is clean and simple– the screw ups are mine all mine, and the beautiful, fun and funny moments are mine too. We’ve had some of both, but I think the ledger is heavier on the good side– though you’d have to ask my daughter. I am increasingly worrying about whether I will lose my job in a matter of weeks. I am trying to help two women who work for me, though their fears and worries too. Though I don’t want to worry her, I know this talk is in the air, so tonight I told my daughter that I may lose my job in a month or I may not, but that we would be fine whatever happens with that. She said a number of interesting things, but one was– “well Mama, just do what you do and go in and work hard!” and the other was, “if you lose your job, we’ll have a party here– a stay-at home-from-work-Mama party.” I can’t argue with her good perspective. Having A (our 19-year-old housemate for the summer) here has brought forth many feelings. I like him a lot. I like many of his friends, some of whom come around a little more and a little more. I like talking to them, I like hearing what he/they are up to and I like a lot of things about having him here. On the other hand, at times his presence, his interest or disinterest in my world and just the fact of someone who is 19 and not 45 or 50– calls forth some feelings that are hard feelings of feeling uninteresting, too old, too unwanted at least some of the time. He has a vibrant connection to a cultural scene here that is very much of interest to me, but that as a mother of a younger child–and a mother past 50 at that– I often miss. He mentions events to me that 20 years ago I would have known were happening– but now I don’t. They are often things I am interested in, but not keyed in to– a Hip Hop Theater week this week, a feminist poetry and spoken word event on gay pride weekend. He goes out and returns home and tells me about some of them. But before I go even a step further down a path of caving to a sexist stereotype of myself being a boring old…. (fill in the blank) which I am not, I am also reminded that I have my own extremely rich and beautiful cultural library, cultural compass. A long history and present life with music, literature, art and now blogs, spoken word. For various reasons last night I thought a lot about the work of poet Marge Piercy. And tonight I was reminded of this artist whose voice and songs brought me to my knees long ago. Joan Armatrading. I searched and found her on YouTube immediately– and she still has a voice that makes you sail and weep–sometimes all in one song. I love her voice, her music and her lyrics, and I admire her because from what I can see in the current videos as well as in her past, she has always eschewed the trappings– and especially the sexist trappings– that are practically synonymous with commercial success. Her clothes are– well clothes, not costumes, she looks like an actual woman and not like the product of an ad campaign. And her voice is beyond compare. My friend B told me tonight that Joan Armatrading is performing at a local, mid-size music venue– tomorrow night. I cannot work out a way to go, but B says the performance is not sold out. We laughed– we said it’s not sold out because the older people aren’t going out to listen to her anymore and the younger people — have never heard of her. Whether you are young or old or in between though, you should hear her. So here it is, my first foray into posting a couple of YouTube links. Stop what you are doing and have a listen– whether you’re like me and have heard these a hundred times before or this is your first listen. It’s been 11 days and counting since I have written and actually posted something here. I miss writing which is a wonderful gift this blog has brought me–a regular practice of writing. Something. Not a poem, not even once so far, not an essay, not a story, but something. Not writing, it seems, is not good for me, like not getting any exercise– 11 days and counting. You may or may not miss it, may or may not notice at all, but I do. A cloud seems to have descended for me. At first I thought it was an issue of time; I have been busy. But then I realized it wasn’t mostly about time. Having this second young person around the house is great. And very distracting in certain ways. There was a weekend women’s liberation workshop for my anti-racist, peer counseling organization last weekend. We were 70 women, ages 17- 75. Over 20 years I have spent countless hours organizing this workshop. But this year I handed over the work to someone else and just attended. My partner and I, with very, very complicated childcare arrangements, were there last weekend. It was a very good workshop and took a lot of time and energy. But no, I don’t actually think those are exactly why I haven’t written here. At my workplace we have known for some time, but got more concrete notice recently that there will be lay-offs at my job in the next month. I need my job. But I may not have it in a month or so. I have no clue whether I will be on that list or not. I have to admit I am scared. And then there is the fact that third grade ended. For my daughter, of course. I truly wish I was a joyfully- welcomes- every- change- as- a- new- opportunity kind of woman. But I am so not. The only change I can easily remember being far more excited than fearful of was the arrival of my daughter. But some, even many other changes that I feared have proven to be wonderful. But in general, I am someone who feels a small or a large knot of dread– and sadness and fear– about so many changes. My daughter’s summer isn’t going great. She went to a wonderful arts camp last summer, and she is back again, but things are really not falling easily into place between her and another girl who was slated to go as her “buddy”. For reasons I cannot explain– I can hardly bear it. She isn’t thrilled but is handling it all ok. And she is going to go to 4th grade next year. Her school is divided into a lower campus and an upper. She will leave the confines of pre-k to 3rd graders and enter a school of 4th to 8th graders. I think she is ready for this. I am not. So here I am with a great big new, unknown future ahead and many fears. And there is the question of whether I will find myself among America’s growing group of unemployed. And whether in my fear I will write more here and find the time to write some poems or go completely silent. I know it is a good thing that my daughter is growing up, and who knows what could come next if I do lose my job? I hope that whatever comes I will write and write and write. I am telling myself, it could actually be just the beginning. Of many things.